- EDAC Inc. is a Canadian success story. Established in 1966, EDAC became a world leader in the Card Edge and Rack & Panel industry. Many of their legacy designs are still in use today, though over the years, they have expanded their line to include one of the widest ranges of interconnect solutions in the world. 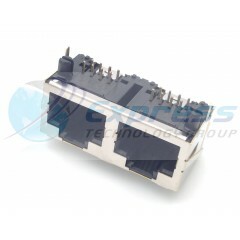 Modular Connectors / Ethernet Connectors 16P 2 PORT R/A RJ45 MOD JACK**In Stock - Same Day Shipping!**.. . . .